The OpenROV team says "you can build it in a weekend" but to us the reality was much closer to 18 months. I think this is an example of how "dreamy" the OpenROV folks are. They have very lofty ideas but execution always leaves something to be desired. A short example, the next version up from 2.5.1 is version 30.0.0. Maybe they fudged the version number, something that could be corrected, but they went ahead with it. It isn't all that revolutionary or a silver bullet for the 2.5.1 problems, just an incremental change. Ah, the perils of being an early backer of an open source project. The upside is that things improve all the time, like software. The downside is that as things improve, you are stuck with the "old world" hardware and software you started with. 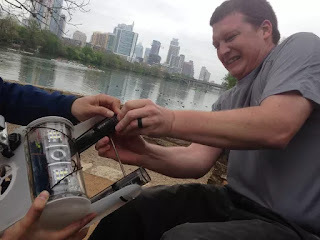 We bought LiPo batteries for our 2.6 kit, and very soon after we found that there was no way to use them, the OpenROV team switched to a new LiFePo battery type requiring all new ROV geometry and chargers. We decided to stick with LiPo and went with a much higher current 26650 battery. Finally, we are ready to actually dive our project OpenROV. It doesn't fly perfectly but we think it is about as good as it can get with this platform. We've fought software, firmware, hardware and collaboration issues to get here. Now that we're ready, the place we thought we were going seems to have slipped further out of reach. Sadly we probably won't be going to Jacob's Well. This is partly because we can't rely on the ROV being able to get back out of the well and the JWEP makes our efforts redundant. It is also worth mention that we couldn't get ahold of anyone at JWNA or Wimberly Valley Watershed to even discuss our project.